First photo: Photographer is Waller of Columbia, Missouri. Written on the back in three different handwritings and pens, getting progressively younger and less shaky, is Son of Theo. & May Guenther / bro J. J. Guenther / graduated at Columbia MO / Jacob Joseph Gunther / LLB. – 1906 / University of Missouri. Second photo: Photographer is Middleton of Butte (Montana, I’m assuming?). Written on the back in the third of the handwritings from the first photo, is Jacob Joseph Gunther / Age – 50. I doubt I would have connected these two photos if it weren’t for the notes on the back, but I can see that they are the same man now that I know. I actually have a bunch of photos from this family, and I am fortunate that somebody bothered to write identifying information on them. I’m sure that this care was taken with the intention that they be handed down for successive generations of the family to cherish, so as usual it feels a little weird to have ended up with them, but I’ll try to do my best by them. I will, of course, post more down the line, but I was fascinated by the juxtaposition of these two. I’m assuming that since the first one was taken in Columbia, and since the notes refer to his graduation, that it was taken around that time, perhaps to commemorate the occasion. So if he graduated with a three-year law degree, shall we assume he was around 25? And if that was 1906, then shall we assume that he was age 50 around 1931? I’m just guessing, but that would seem to match the visual evidence of the clothing, the frame styles, etc. And that’s assuming the handwritten notes have stated accurate information. 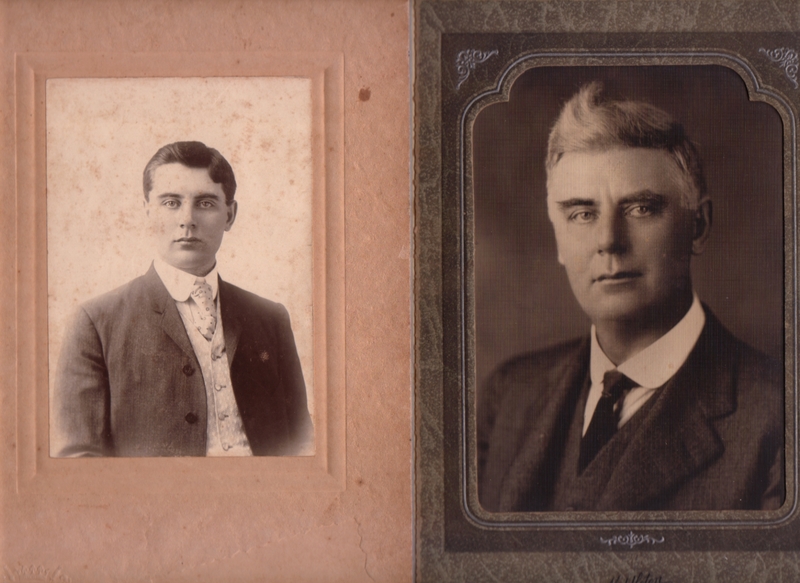 Also, this set of family photos makes for an interesting study in assimilation since the last name is variously spelled “Guenther”, “Günther”, and “Gunther”. Your detective work in analyzing these photos is nothing short of amazing, Matt. Truly wonderful to read. I have a hard time seeing these two men as the same person. How we do change! So nice that you are the one who ended up with the photos from the family. So sad they weren’t passed down, but at least they are in wonderful hands. Good work, Matt. He seems to have grown a Tintin quiff in his old age!